brandflakesforbreakfast: lilac, tiger, berry...oh my! 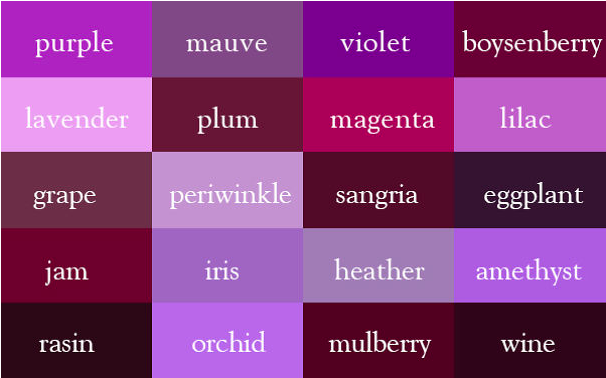 You know that mind-boggling feeling when you're trying to describe a color, but can't find the exact word? 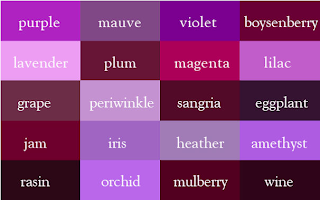 Ingrid Sundberg, a writer and children’s book illustrator, created the ultimate reference chart to describe any hue in question. So next time you're looking at those brand new shoes the sales lady convinced you into thinking were black, perhaps you'll re-evaluate - because after all, they could be: ebony, ink, raven, oil, onyx, or pitch. Mind: blown.